Yesterday I had a friend (and fellow blog member) over for lunch. She brought yummy cheeses and bread and I made lobster bisque. 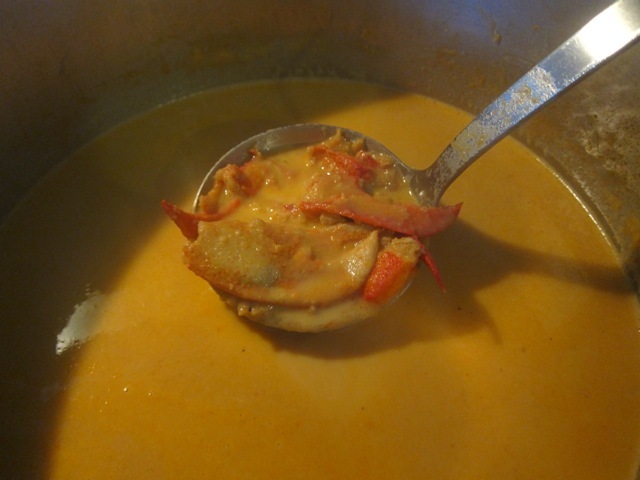 I followed the recipe in the New England Soup Factory Cookbook except that instead of 1 cup of white wine I just added more lobster stock. First you chop up celery, carrots, onion and garlic and cook it in butter, then add 4 pints of stock (I added 5, since each jar is actually less than a pint and it likely added up to a volume equal to 4 pints of stock and 1 cup of wine), 2 cut up potatoes, and tomato paste. After simmering until the potatoes are soft, you use an immersion blender to puree it, then add the lobster (1 to 1.5 pounds), worcestershire sauce, tobasco sauce, and some brandy. I stopped here until we were almost ready to eat then added a pint of heavy cream. It made a lot of soup. After we all ate, I froze 2 quarts and there is more in the fridge for today. Haha. So I made the mistake of going home and trying mascarpone cheese with honey. Now I have no more mascarpone cheese! Did you finish off all that honey, too?